Futurism in fashion is not limited to the artistic movement alone. The pervasive conceptual and visual influence of futurist art at the beginning of the twentieth century accounts for the fact that the term "futurism" continues to be applied-in the case of fashion to designs that are made from unorthodox materials, demonstrate new technologies and shapes, and display colorful dynamism. Futurism as a modernist movement was born on 20 February 1909 when Filippo Tommaso Marinetti published his manifesto "Manifeste du Futurisme" in the Paris daily Le Figaro. His aim was to extol the shock of the new (as cubism had done previously). 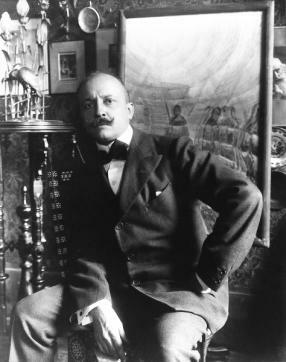 However, whereas the provocation had previously been limited to museums or books, Marinetti wanted to extend it to social and political life. While futurist paintings mixed stylistic idioms from cubism and divisionism, its poetry, music, photography, film, and drama expanded along more abstract principles like speed, novelty, violence, technology, nationalism, and urbanity, which were often expressed according to prior formulated declarations. For fashion the programs were written by Giacomo Balla in the form of the "Futurist Manifesto of Men's Clothing" of 1914, followed by his "The Anti-Neutral Clothing: Futurist Manifesto" of the same year; in 1920 the "Manifesto of Futurist Women's Fashion" by Volt (pseudonym of Vincenzo Fanni); 1932 saw the "Manifesto to Change Men's Fashion" by the brothers Ernesto and Ruggero Michahelles; then Marinetti collaborated with Enrico Prampolini and a couple of second-generation futurists on "Futurist Manifesto: The Italian Hat," and in 1933 the "Futurist Manifesto: The Italian Tie" was formulated by Renato di Bosso and Ignazio Scurto. The trajectory of these various programs can be constructed parallel to changes in futurist art from the avantgarde protest of its first generation, through the drama of World War I and sobriety of the time after the conflict, and the decorative subjectivism of the interwar years, to the rise in nationalist culture that would lead to the close association in the early 1930s between futurism and fascist Italy. The manifestos about fashion accordingly move from the direct intervention into culture by transforming the appearance of man-and to a lesser extent woman-in the street, where it was hoped that manners and mores would follow radical alterations in the bourgeois dress code, via a utilitarian attitude to dress as expression of communal principles, and the design of decorative and colorful costumes, to the fervent declaration of a nationalist dress. These various attitudes are not dissimilar to those that other art movements displayed vis-à-vis fashion, for example, aesthetic dress in Vienna or Proletkult clothing in 1920s U.S.S.R. Only futurism, however, ran through the entire range of oppositional clothing, from radical individualism to collective uniform, from decadent subjectivity of sartorial expression to formal invention in the construction of clothes. Despite the founding role of poetry (with its onomatopoetic "parole in libertà") futurist aesthetics were disseminated markedly through painting. This implies a leaning toward decorative rather than structural solutions. And it favors the alteration of visual appearances and style (artistic, mode of living) rather than changing the sociopolitical foundation of artistic production proper. Similarly, fashion in futurism was often conceived as decorated surfaces of fabrics and textiles, where the introduction of color functioned as a novel element. An actual change in the cut and construction of clothes was comparatively rare. From its very beginning futurism had a strong performative quality. Through the primacy of speed and dynamics, the representation of objects in movement became paramount. This was demonstrated not only through actual performances-although the poetry readings, musical soirées, and theater pieces, as well as demonstrative excursion in the motorcar, initiated an early concept of "performance art." Significantly, futurist photographs and canvases aimed at showing successive stages of an object moving through space. This in turn accounts for the early significance of fashion, as an aesthetic expression that is directly-and almost exclusively-applicable to the active and activated body. Futurists like Balla and Fortunato Depero, who both designed costumes for the Ballets Russes in Paris, realized the opportunity of playing with volumes, density of material, and animated objects. Balla's early designs between 1912 and 1914 show the attempt to break the surface of the body into fractions and lend movement to even heavy and static cloth. He hoped that the painted "speedlines" and colorful beams on the fabric would render even the most conservative and immovable individual a model of dynamism. Balla himself sported his designs well into the 1930s and conceived a rapid manner of walking and moving appropriate for the aesthetic principles of his dress. In contrast Marinetti, Depero, and others favored more staid sartorial expressions, wherein brightly colored waistcoats or ties offered the habitual outlet for individualism (1920s). Whereas men's bourgeois suits, as the somber constructed mainstay of modernity, offered the most obvious target for a futurist reform of the dress-code, women's fashion with its seasonal changes and decorated surfaces did not appear to require the same reformist zeal. Thus the futurist contribution to female dress is to be found outside Italy, in the "simultaneous" dresses by Sonia Delaunay created in Paris in the 1920s and the cubo-futurist costumes by Alexandra Exter and Liubov Popova made in Moscow from 1915 onward. Balla had attempted to provide new patterns for the cut of shirts and suits that were based on geometric principles of nonobjective paintings, but it took Ernesto Michahelles, who worked under the pseudonym Thayaht, to innovate a utilitarian and unisex dress that was based on the progressive notion that form and volume were to follow only inherent constructive principles. His "Tuta" of 1918 was designed as a cheap and uniform overall that due to its simple pattern could be tailored at home from a variety of fabrics. The aim was to provide "sportswear" that maximized freedom of movement for the body and directed an active lifestyle and corporeal ideal that would feed later into the fascist glorification of athleticism. In the early 2000s "tuta" is used in Italy to denote a track-suit and Thayaht, who went on to illustrate haute couture for Madeleine Vionnet, thus designed a template for the emancipation of the body in the time between the wars. More decorative solutions for the embellishment of dress came from Depero, whose contribution lies in the commercial viability of his designs for fashion boutiques, posters, and the theater, from Tullio Crali who continued Balla's efforts to redesign the jacket and suit, and from Pippo Rizzo's textiles. Balla's first Manifesto of 1914 had proclaimed: "We must invent futurist clothes, hap-hap-hap-hap-happy clothes, daring clothes with brilliant colors and dynamic lines. They must be simple, and above all they must be made to last for a short time only in order to encourage industrial activity and to provide constant and novel enjoyment for our bodies." It was a sartorial call to arms that mixed progressive aesthetics in dress with a shrewd understanding of its commercial and industrial basis, thus perfectly fitting as a credo for the artist engaging in modernity. See also Art and Fashion; Theatrical Costume. Balla, Giacomo. "Futurist Manifesto of Men's Clothing." In Futurist Manifestos. Edited by Umberto Apollonio. London: Thames and Hudson, Inc., 1973. Crispolti, Enrico. Il Futurismo e la moda. Venice: Marsilio, 1986. Fiorentini Capitani, Aurora. "Tra arte e moda." Imago Moda no. 1, Florence 1989. Hulten, Pontus, ed. Futurism & Futurisms. London: Thames and Hudson, Inc., 1987. Lapini, Lia, ed. Abiti e costumi futuristi. Pistoia, Italy: Edizioni del Comune, 1985. Lista, Giovanni. Balla. Modena, Italy: Galleria Fonte d'Abisso, 1982. --. "La Mode Futuriste." In Europe 1910-1939. Edited by Valérie Guillaume. Paris: Les Musées de la Ville de Paris, 1996. Ruta, Anna-Maria. Arreddi Futuristi. Palermo, Italy: Il labirinto, 1985. Scudiero, Maurizio. Fortunato Depero. Trento, Italy: Il Castello, 1995.